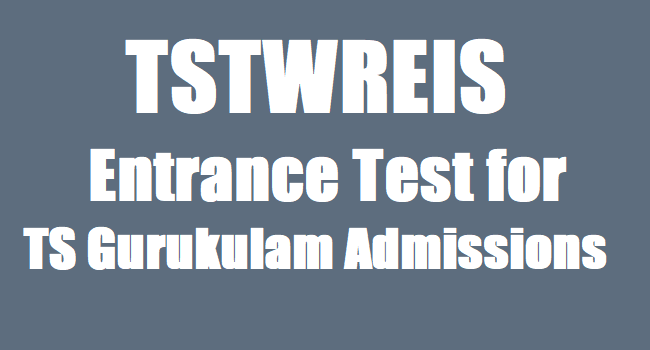 TSTWREIS GURUKULAM Sixth class Entrance Test 2019: All the ST students (Boys & Girls) who were appeared the 5th class March - 2019 in Telangana State Govt. Schools and other Govt. Recognized schools are eligible to write the 6th Class Entrance to admit in Telangana Girijana Gurukulams for 2019-2020. 1) SC / ST students should have born between 01.09.2006 to 31.08.2009. 2) OC / BC / SC-Converted Christians (BC-C) should have born between 01.09.2007 to 31.08.2009. 3) The student should have studied continuously in the respective district for the two academic years (2017-2018 and 2018-2019) in a Government school or in a school recognized by the Government. 4) During the year 2018-2019 candidates must be studying 5th class continuously in a Government school or in a recognized school. 5) The parental income for the year 2018-2019 should not be exceed Rs.65,000/- per annum for rural areas and Rs.75000/- for Urban areas. 6) The candidates can apply to any TSTWR School of the district for which he / she belongs. 8. 06 Passport size photos ,etc., at the time of admission. All the eligible ST students only shall apply through online mode @ http://swreishms.cgg.gov.in/tstw/. Hall tickets will be generated after completion of online application submission. #Hall Tickets: Hall tickets will be generated after completion of online application submission. The Entrance test will be of objective type & multiple choice questions from Class 5th.